When you think Gilmore Girls, you think coffee, pop culture references, and fast talking. You don’t necessarily think show-stopping Broadway musical numbers, but when Gilmore Girls: A Year in the Life kicks off on Netflix in a week, go ahead and throw that in with everything else Rory and Lorelai will be discussing. 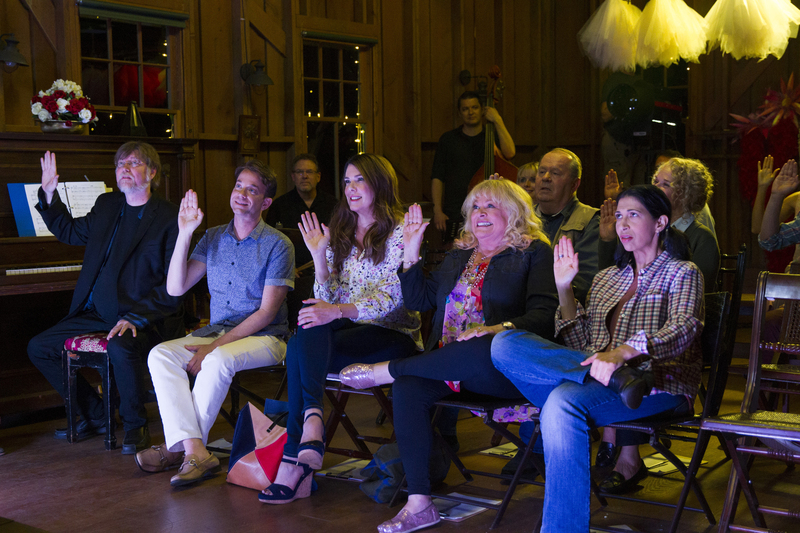 Stars Hollow is putting on a, well, Stars Hollow Musical. For anyone who has ever wanted a musical Gilmore Girls episode (omg, the dream), we’ll be treated to a part of one during the episode, “Summer.” Promise to keep you away from spoilers, but Taylor decides that it’s time to celebrate the history of Stars Hollow and to do this, the town should put on a musical. Because, why not? If you can have a knit-a-thon and a hay bale maze and a festival of living art why NOT stage a musical as well? And while Amy Sherman-Palladino has written just about everything else for Gilmore Girls (save, for Season 7) she did not write the musical. Instead, that fell on the shoulders of Tony Award winning composter Jeanine Tesori, who’s best known for Fun Home, Shrek: The Musical, and Violet — the last two starred Sutton Foster who is coming to Stars Hollow to star in Stars Hollow the Musical, got that?? In a new interview in Variety *just* about the musical, Jeanine reveals that there are four songs in the musical, and that the story goes, Taylor believes he’s “writing what he thinks is a great musical.” Okay, we’ll let the next town meeting be the judge of that. BUT LIKE CAN YOU? When asked further if a Gilmore Girls musical could become a reality, she responds that she’d do it “in a heartbeat” and suddenly our own hearts are beating very fast. It might not be long before we see Rory and Lorelai become triple threats — singing, dancing, and drinking coffee all at the same time.